I finished these guys up this weekend while trying to get the last of my other projects done (Storm Wardens). You can click on either image above for a larger version. These guys came to me already built and primed, all I needed to do was paint them up to my friend's specifications. I was not responsible for painting the bases and that's why they're left undone if you're wondering. I did have to make one small change to one dreadnought since I kept breaking the little pelts that were hanging from the sarcophogus. I replaced them with something a little more substantial that would hold up to game play. 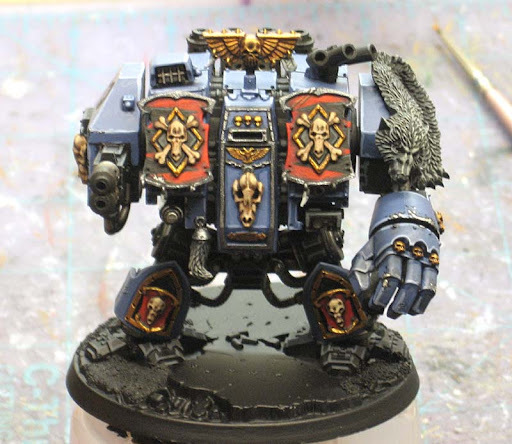 You may notice the right arm position of the second dread, it's easy enough to do this, I have a tutorial for repositioning Space Marine arms, but the idea is the same and can be applied to dreadnoughts too. I used one of the Dark Angles vehicle banner things with all the trinkets attached to it. I just cut off the trinkets and sculpted the gap across the top where I had to cut some other stuff out. Of course I did the standard fare as well, drill out gun barrels, trim mold lines, add battle damage (The Painting Corps has a good article on battle damage), soot and exhaust stains, etc. to these guys. Both of them get one of these to ride in as well. 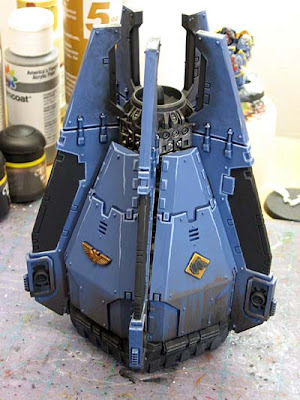 The Magnet Pro has got an article on magnetsing Drop Pod doors for those looking to go the extra mile with magnets or even converting your regular Drop Pod into a dreadnought version. Fortunately I finished these ahead of time so my friend should be able to use them much sooner than he anticipated. 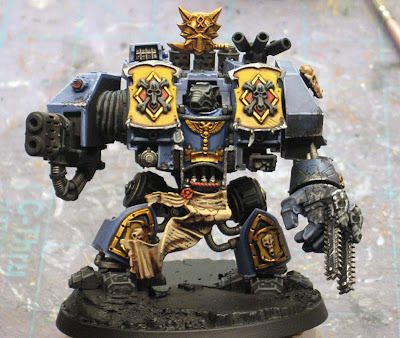 I'll be nicking the vehicle banner idea for a GK Dread in the works. I'm not familiar with the chain sword bits you've used on the 2nd Dread. I know you didn't build it, but do you know where those came from? Honestly, I have no idea. If the owner doesn't reply to this directly, I'll ask him on Friday when I give him his models back. Never mind, I found them. They are standard Space Wolf chain swords. If my conversion idea for them ever gets to the front of the queue, I know where to look now. Thanks! Correct, those swords came from my left over bits from the new Space Wolf boxes. 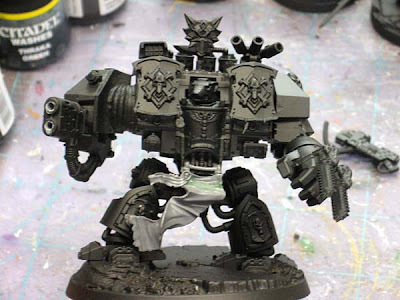 They look very nice and make me want to go out and buy some Venerable Dreadnoughts sooner than I plan. The two Dreadnoughts look terrific. Very well done.